12 Broadcaster Press March 20, 2018 www.broadcasteronline.com Exploring Innovative Rural Communities Conference BROOKINGS, S.D. - Registration is now open for the Energize! Exploring Innovative Rural Communities Conference, set for May 8-9, 2018 in De Smet. Rural leaders and doers are invited to re-invigorate their community work during the conference, which is hosted by SDSU Extension Community Vitality together with leaders of the De Smet community. "Participants will network with rural community leaders from across the state, hear and share success stories, and gather ideas they can take home and act on in their communities," said Paul Thares, SDSU Extension Community Vitality Field Specialist. Conference sessions will be led by a team of experts from across South Dakota and will focus on the following: 1.Funding for Community Projects 2.Entrepreneurial Experiences 3.Agritourism and Value-Added Agriculture 4.Engaging Community Members A panel of young entrepreneurs will also share their perspectives on building businesses in rural South Dakota. The event will also feature Sarah Calhoun, as the keyBroad note speaker. Calhoun is the owner of Red Ants Pants. caster the ine She is also the Executive Director ofonlRed Ants Pants .com Foundation and Producer of the Red Ants Pants Music Festival. She will share her story of successful business growth and development in the rural community of White Sul- phur Springs, Montana (population 906). In addition she will share information on a large community event and a foundation that were started as a result of her successful business growth and community involvement. To register for the Energize! Exploring Innovative Rural Communities Conference visit the iGrow Events page. To cover costs, the registration fee is $59 through April 6. After April 7 through the April 30 registration deadline, the cost is $75. Youth may attend for $40. The event will begin at the De Smet Event and Wellness Center (705 Wilder Ln) and progress through several downtown businesses. To follow the event on Facebook search for "Energize Exploring Rural." The conference location itself will invite innovative thinking. Instead of discussing building rural communities in a Sioux Falls or Rapid City hotel conference room, sessions will be hosted by De Smet's downtown businesses. Before each session begins, business owners hosting the session and their employees will briefly share their stories. "We think it makes sense to have a conference about rural communities in a rural community," said Peggy 2x1 Schlechter, SDSU Extension Community Vitality Field Specialist. "This allows participants to become immersed in a rural community and relate to so many things that they see and do their own communities." The idea for this event, Thares explained, came out Broadcasteronline.c om Save $30 on a Summer AC Tune-Up! 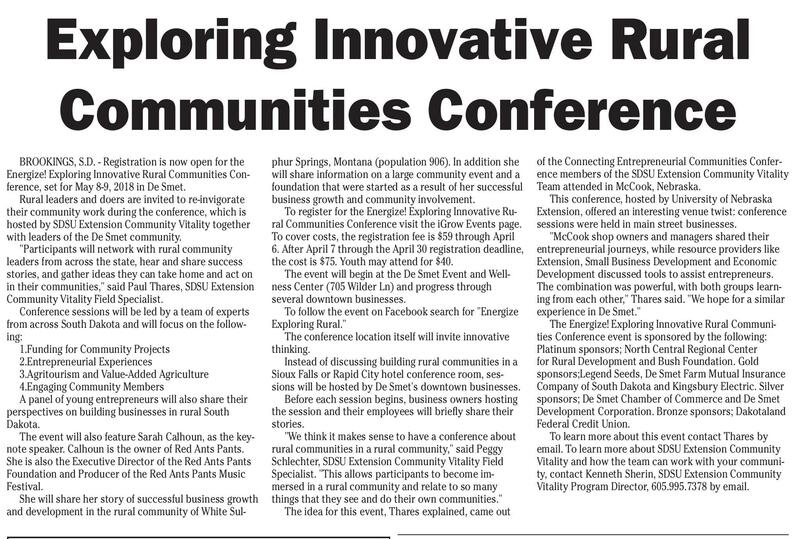 of the Connecting Entrepreneurial Communities Conference members of the SDSU Extension Community Vitality Team attended in McCook, Nebraska. This conference, hosted by University of Nebraska Extension, offered an interesting venue twist: conference sessions were held in main street businesses. "McCook shop owners and managers shared their entrepreneurial journeys, while resource providers like Extension, Small Business Development and Economic Development discussed tools to assist entrepreneurs. The combination was powerful, with both groups learning from each other," Thares said. "We hope for a similar experience in De Smet." The Energize! Exploring Innovative Rural Communities Conference event is sponsored by the following: Platinum sponsors; North Central Regional Center for Rural Development and Bush Foundation. Gold sponsors;Legend Seeds, De Smet Farm Mutual Insurance Company of South Dakota and Kingsbury Electric. Silver sponsors; De Smet Chamber of Commerce and De Smet Development Corporation. 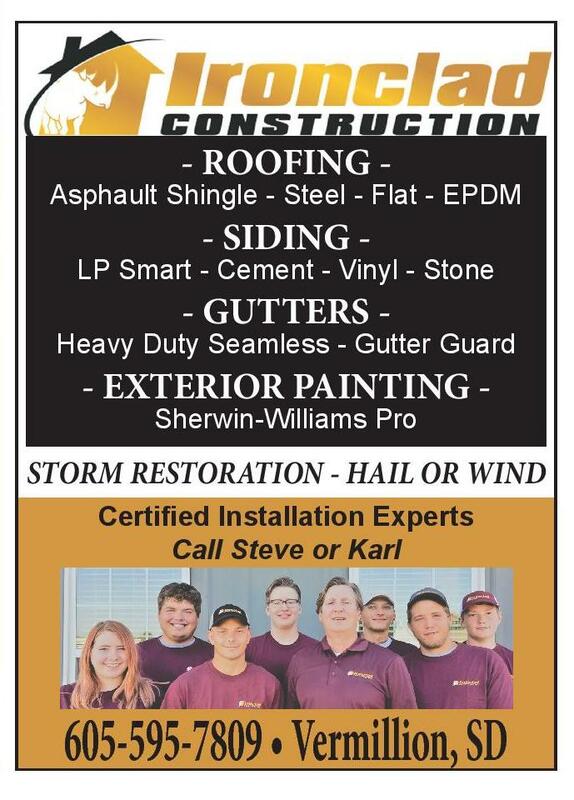 Bronze sponsors; Dakotaland Federal Credit Union. To learn more about this event contact Thares by email. To learn more about SDSU Extension Community Vitality and how the team can work with your community, contact Kenneth Sherin, SDSU Extension Community Vitality Program Director, 605.995.7378 by email. Funds Available For Specialty Crop Advancement 3x1 Game, Fish And Parks To Stock Just give us a call and we’ll B Below Oahe onl send out a qualified Rainbow TroutroadcasterDamine.com Service Technician like Tyler, to make sure your PIERRE, S.D. - South Dakota Game, Fish and Parks (GFP) will stock rainbow trout at AC unitOahe Marina on March 27, weather permitting. is ready for those 4x1 Crews from Cleghorn hot summer South Dakota Springs State Fish Hatchery in Rapid City will stock rainbow trout ranging in size from 10 to 12 inches in length. Tyler Reiser days and save $30! 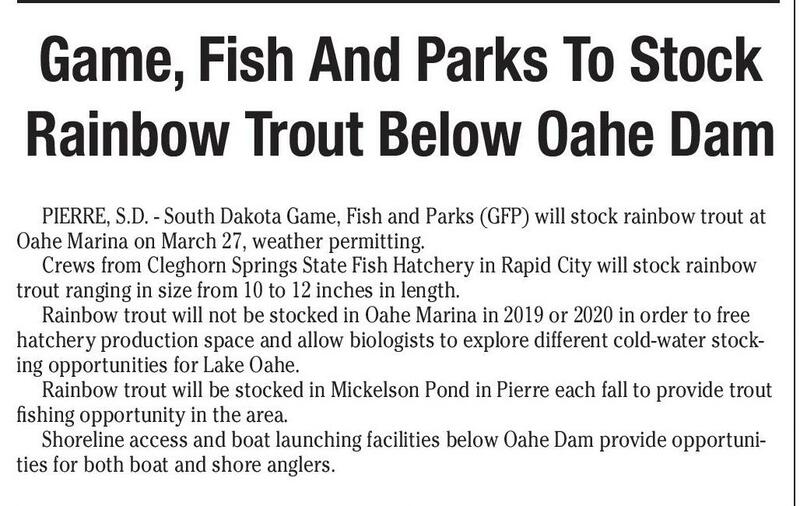 * will not be stocked in Oahe Marina in 2019 or 2020 in order to free Rainbow trout Service Technician hatchery production space and allow biologists to explore different cold-water stock13 years ing opportunities for Lake Oahe. experience Rainbow trout will be stocked in Mickelson Pond in Pierre each fall to provide trout fishing opportunity in the area. Shoreline access and boat launching facilities below Oahe Dam provide opportunities for both boat and shore anglers. When You Want Comfort...You Want Kalins When You Want Comfort… You Want Kalins! Vermillion: 605-624-5618 *Rebate offer only available to Vermillion Light & Power customers. Call for full details. 69 years as a Premier Lennox® Dealer 96 years in the Business 400 years of Heating and Cooling Experience = Your #1 Choice in Vermillion! Yankton Vermillion Sioux City 605.665.4348 605.624.5618 712.252.2000 kalinsindoor.com R??b?? C???n? C????ra?i??! Maximizing Excellence, LLC PIERRE, S.D. –The South Dakota Department of Agriculture (SDDA) announces that funds are available for Specialty Crop Block Grants. The funds can be used for marketing, promotion, research, food safety, nutrition, distribution and best management practices to advance the specialty crop industry. Specialty crops are generally defined as fruits, nuts, vegetables, honey and some turf and ornamental crops. A full list of specialty crops is also available on the SDDA website http://sdda.sd.gov/. “These grants give farmers a way to increase the demand for the specialty crops they’re already growing,” says SDDA grant and loan specialist, Kimberly Sturm. “This year’s projects are maximizing the value of specialty crops and contributing to South Dakota’s greater agricultural economy.” Stakeholders have identified this year’s top priorities as enhancing the competitiveness of specialty crops through increased sales, increased consumption and sustainable practices of specialty crop production. The deadline for applications is May 1, 2018. Details explaining the application are available at https://sdda. sd.gov/grants/specialty-crop-block-grant/. Applications should be submitted via email to kimberly.sturm@state.sd.us and four printed copies, including an original must be mailed to SDDA at 523 E Capitol Avenue, Pierre, SD 57501. Applications are due May 1, 2018. 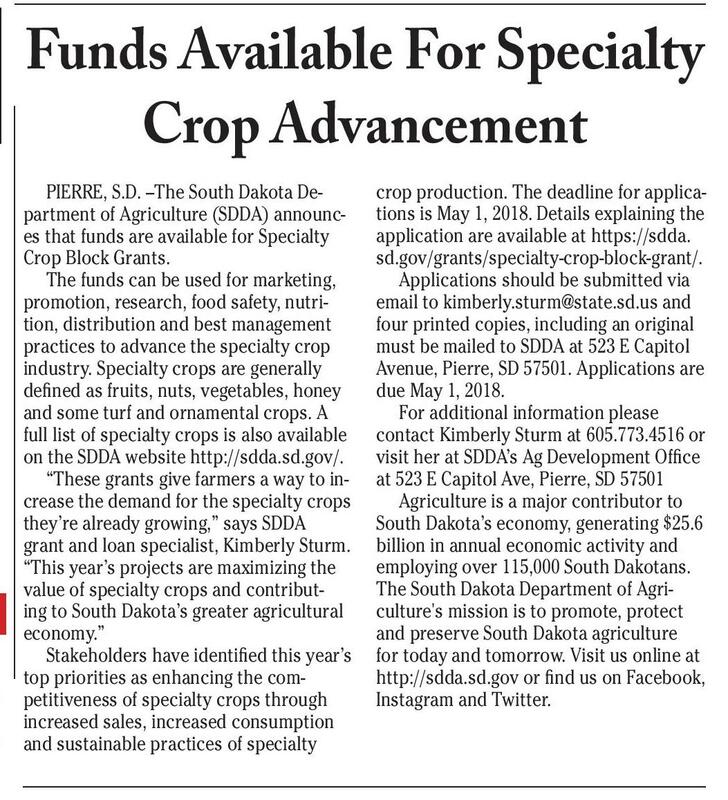 For additional information please contact Kimberly Sturm at 605.773.4516 or visit her at SDDA’s Ag Development Office at 523 E Capitol Ave, Pierre, SD 57501 Agriculture is a major contributor to South Dakota’s economy, generating $25.6 billion in annual economic activity and employing over 115,000 South Dakotans. The South Dakota Department of Agriculture's mission is to promote, protect and preserve South Dakota agriculture for today and tomorrow. Visit us online at http://sdda.sd.gov or find us on Facebook, Instagram and Twitter. Know Your Numbers Know Your Options BROOKINGS, S.D. 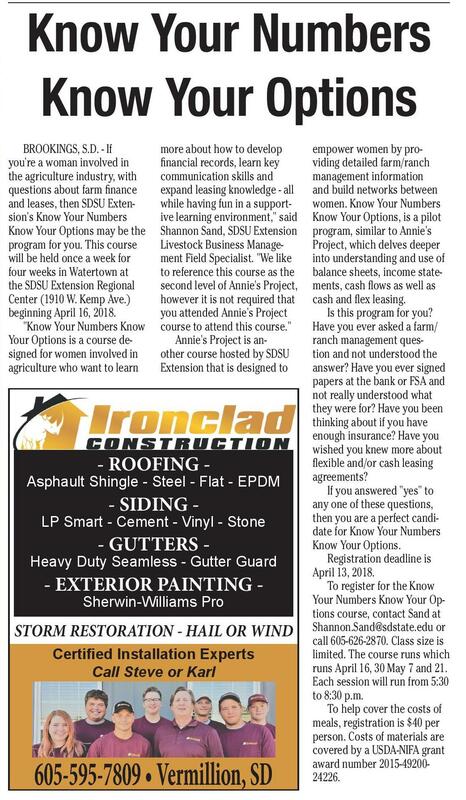 - If you're a woman involved in the agriculture industry, with questions about farm finance and leases, then SDSU Extension's Know Your Numbers Know Your Options may be the program for you. This course will be held once a week for four weeks in Watertown at the SDSU Extension Regional Center (1910 W. Kemp Ave.) beginning April 16, 2018. "Know Your Numbers Know Your Options is a course designed for women involved in agriculture who want to learn more about how to develop financial records, learn key communication skills and expand leasing knowledge - all while having fun in a supportive learning environment," said Shannon Sand, SDSU Extension Livestock Business Management Field Specialist. "We like to reference this course as the second level of Annie's Project, however it is not required that you attended Annie's Project course to attend this course." 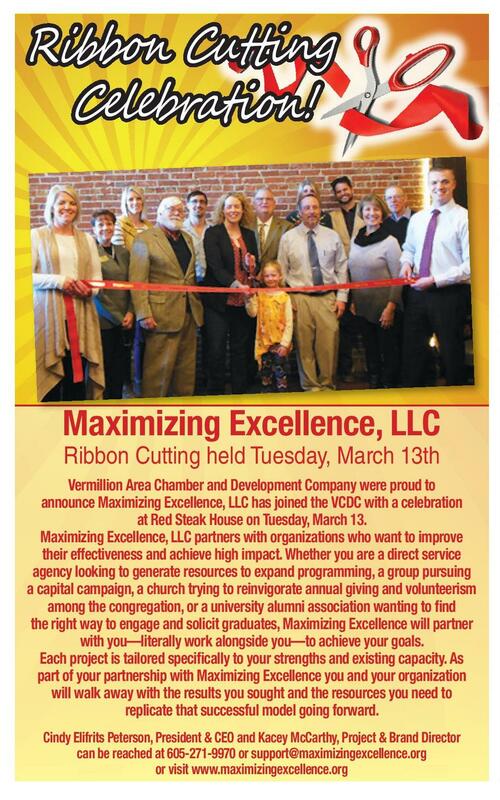 Annie's Project is another course hosted by SDSU Extension that is designed to - ROOFING - Ribbon Cutting held Tuesday, March 13th Asphault Shingle - Steel - Flat - EPDM Vermillion Area Chamber and Development Company were proud to announce Maximizing Excellence, LLC has joined the VCDC with a celebration at Red Steak House on Tuesday, March 13. Maximizing Excellence, LLC partners with organizations who want to improve their effectiveness and achieve high impact. Whether you are a direct service agency looking to generate resources to expand programming, a group pursuing a capital campaign, a church trying to reinvigorate annual giving and volunteerism among the congregation, or a university alumni association wanting to find the right way to engage and solicit graduates, Maximizing Excellence will partner with you—literally work alongside you—to achieve your goals. Each project is tailored specifically to your strengths and existing capacity. As part of your partnership with Maximizing Excellence you and your organization will walk away with the results you sought and the resources you need to replicate that successful model going forward. LP Smart - Cement - Vinyl - Stone Cindy Elifrits Peterson, President & CEO and Kacey McCarthy, Project & Brand Director can be reached at 605-271-9970 or support@maximizingexcellence.org or visit www.maximizingexcellence.org - SIDING - - GUTTERS - Heavy Duty Seamless - Gutter Guard - EXTERIOR PAINTING Sherwin-Williams Pro STORM RESTORATION - HAIL OR WIND Certified Installation Experts Call Steve or Karl 605-595-7809 • Vermillion, SD empower women by providing detailed farm/ranch management information and build networks between women. Know Your Numbers Know Your Options, is a pilot program, similar to Annie's Project, which delves deeper into understanding and use of balance sheets, income statements, cash flows as well as cash and flex leasing. Is this program for you? Have you ever asked a farm/ ranch management question and not understood the answer? Have you ever signed papers at the bank or FSA and not really understood what they were for? Have you been thinking about if you have enough insurance? Have you wished you knew more about flexible and/or cash leasing agreements? If you answered "yes" to any one of these questions, then you are a perfect candidate for Know Your Numbers Know Your Options. Registration deadline is April 13, 2018. To register for the Know Your Numbers Know Your Options course, contact Sand at Shannon.Sand@sdstate.edu or call 605-626-2870. Class size is limited. The course runs which runs April 16, 30 May 7 and 21. Each session will run from 5:30 to 8:30 p.m. To help cover the costs of meals, registration is $40 per person. Costs of materials are covered by a USDA-NIFA grant award number 2015-4920024226.